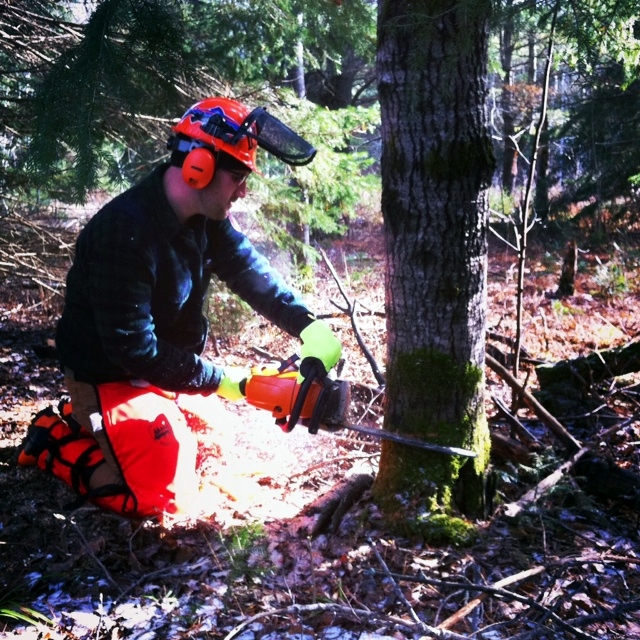 Damn Yak Dry Goods Co.: A Field Test: Superior Glove Endura Chainsaw Glove. A Field Test: Superior Glove Endura Chainsaw Glove. When working with any cutting tools safety is always number one. Being protected and taking your time is all that matters when working in the bush. You could be miles from help, deep through thick forest with possibly lakes between you. You must slow down, think of your steps and be sure to not skimp on PPE (Personal Protection Equipment) costs and worthiness. As cheesy as it sounds, your life depends on it. Chainsaws are the worst of the worst in terms of damage caused per duration of time. The average chainsaw wound requires 110 stitches.110 folks. My goodness. Last year my family purchased 21 acres of beautiful forest in Huntsville, ON. And while we are in the deciding stages of life paths, we will be using the forest for camping, and harvesting wood for heat as well as building supplies. Since we will be cutting the trees ourselves as a side project, having top notch PPE is essential. As I searched the Internet to find what is the appropriate PPE for chainsaw work it came down to a few items. Head protection, Ear, eye, Leg, Foot, and lastly hands. With me being based in Milton, it came to my surprise that one of top rated gloves was being made by of Superior glove. Superior glove’s head office is a mere 10 min from my home. I was fortunate enough to have the opportunity to try out Superior Gloves new Endura Chainsaw Gloves. How not to wear a face guard. The gloves are a bright Blaze yellow, so you do not lose them if you put them down in the bush. Look wise, very similar to the now popular “mechanic” gloves. They have 8 layers of a chain stopping specific Kevlar. Their spec sheet states “…designed to withstand a chainsaw running at 3140 feet per minute. This meets the EN 381:1999 Class 0 for chainsaw cuts.” The palms are a goatskin with Anti-vibration pads in key spots within the grip to help dampen the movement of the saw. They all in all were super comfortable to work with. The seams inside the glove were a tad stiff when new, and had me concerned if rub points once I started sweating. However the seams actually softened up when they got wet with punky wood and sweat. One of the great features I really liked was the cuff. The gloves go well up your arm almost past where one would wear a wristwatch and seals tight with an elastic and Velcro closure. This I found very helpful keeping bits of wood out of the glove compared to my previous Deer hide ropers. 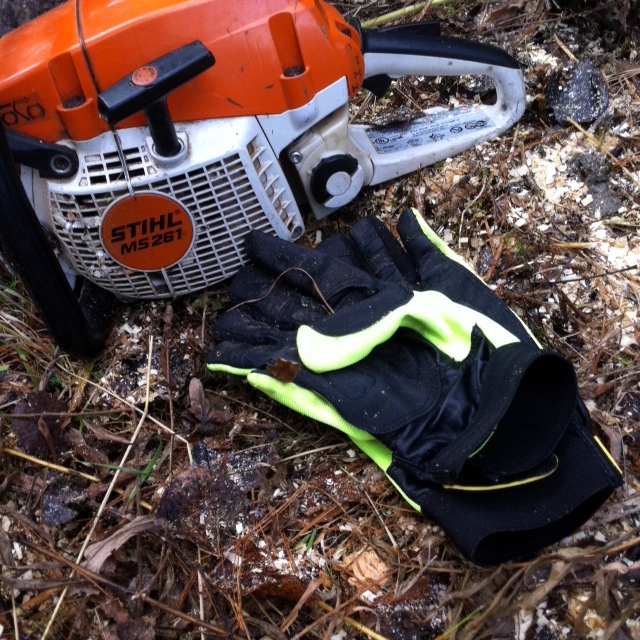 One less thing to deal with…shaking wood chips out of your gloves every now and then. The Anti-vibration pads were quite helpful, as after the second 7-hour cutting day my hands felt normal. I am sure you would get more protection out of a dedicated anti-vibration glove. The Endure is a healthy median. No buzzing or numbness from the saw being in my hand all day. 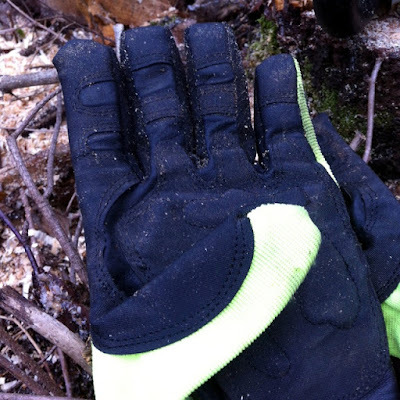 The gloves leather palm also was great as a general work glove, moving the felled logs, gripping them when wet and dry. I never felt as if the glove was sliding off or I was going to lose my grip. The quality of the stitching was great. While Superior does make many of it gloves in Canada, these are made offshore. That being said, you can see that Superior keep very tight control over their standards of quality to ensure good products make it out to the market. There was really only one concern I had with these gloves. That issue being that the black dye that the leather manufacturer uses in the goatskin come off onto quite a bit onto your hands. I have used these gloves for about 40 hours now...and every time I sweat in them…my hands turn black. While the majority of it comes off with a hand washing, some if still left for a couple days. I had the pleasant experience of wiping my face with black hands and leaving black all over my face. Pretty funny. I looked like a football player with the black lines under my eyes. The very thick Kevlar Pad on the top of the left hand. 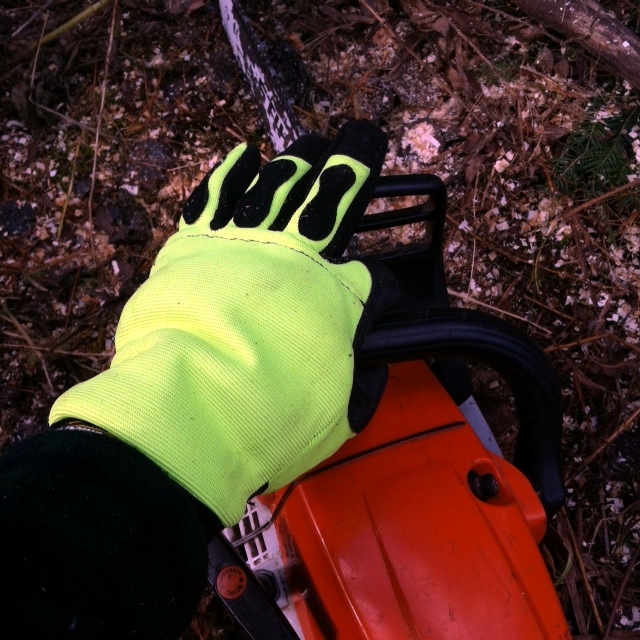 The Endura glove is a solid chainsaw safety glove as well as a work glove. While I am fortunate enough to have not have had to try out the Kevlar protection, it’s nice to know its there incase I do need it one day. Some argue that wearing PPE makes you more complacent. I think that chainsaw safety equipment only offers a bit of protection. It’s not meant as bulletproof armor, but can help if a true accident happens. You still need to have complete focus on the job at hand making sure you are well footed, and practicing proper techniques. Its nice to have a great local company like Superior Glove going the extra length to add more layers of Kevlar protection then other brands that we as consumers can get in Canada. After the 40 or so hours of sweaty palmed chainsaw use, heaving wood into a stackable pile there has been no seam seperation or excessive wear on any high friction areas. The gloves obviously loosen a bit when wet, but the gloves shrink back to a great fit when dry. 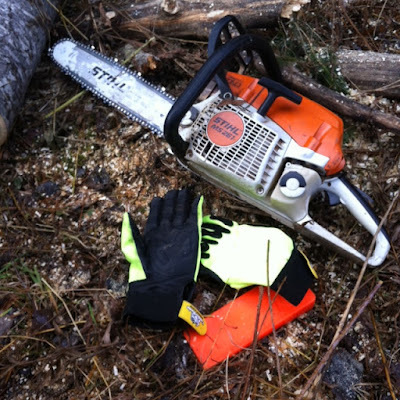 If your in the market for new high performance Chainsaw gloves and don’t mind a bit of black ghosting on your hand for a couple days, take a look at these bright gloves (Superior Gloves also make a mitt version). With the Endura gloves you can feel reassured knowing that you will have the protection you need…when you need it. Trekking in Nepal is delighted to welcome to you tiny but amazing country in Nepal. There are attraction sharing and memorable your life with TreksHimalaya, found by the team of enthusiastic and the trekking specialists is devoted to impart you a fondest memory during your holidays with us for hiking in Nepal. We have been serving not only in Nepal also Tibet tours and Bhutan tours as well. Either Nepal trekking, Helicopter Tours, Mountain Flight, Peak Climbing, Honeymoon Tours, Nepal tours, Rafting, Jungle Safari, Pilgrim’s Tour, Hotel Reservation, Air Ticket, Tibet and Bhutan Tour many more your vacation desire. Nepal traveling with us is more than just a brief to stay somewhere. Tea house trek in Nepal offering for small trekking groups and big trekking groups. Anyone with a join up to strong legs and strength of adventure to discover the exotic will pleasurable the excitement of tours trekking in Nepal is delightful exposure. it's very dangerous! thanks for sharing this masterpiece with us! I want to take a photo! The post is in sooth great, thanks for sharing! I wonder where could I buy such a glove? How much does it cost? In order to protect yourself while working with such a tool, it is worthwhile to approach the choice of gloves for work. 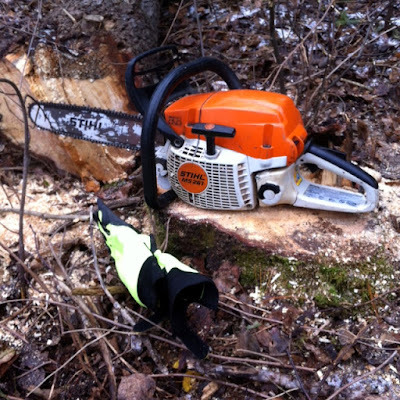 A basic chainsaw might be perfect for a weekend warrior looking to trim some branches but it’s not going to cut it for anyone working in forestry.